Harp Aeolienne: It's Come Home! For many years I was a busy church organist. I started playing for Sunday school at the age of eight. Over the years I played for countless weddings (always gratis), usually always played for at least one service a week and helped out other congregations when their organist was away or sick. I also had a deep love of old reed organs (pump organs). I loved that no electricity was needed and that the sound was produced purely by wind being pumped over cleverly voiced brass reeds. I loved the intricate craftsmanship of these old reed organs too. 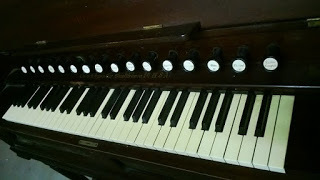 With technique practice, these old organs can sound amazing. 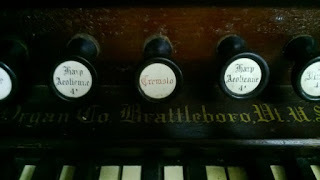 Back in the late 1990's I was on the search for a big reed organ to buy - not the small specification parlour reed organs that are a dime-a-dozen, but the ones with many ranks that were designed to be played in churches and for an audience. These rare large reed organs had a wonderful variety of tonal voicing and in the hands of a passionate organist could muster up any emotion required in a congregation. 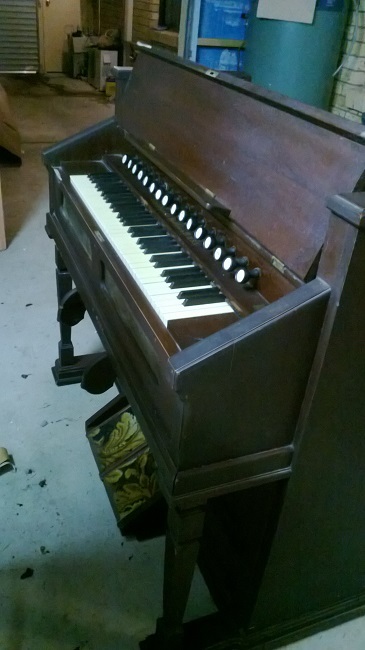 So, it ended up that a lovely South African couple that I knew had a small collection of reed organs and offered me a rare 1910 Artist's model Estey reed organ for a very generous price of $1000.00. I took out a bank loan and bought the thing (!). It was simply tonally stunning. Friends often used to joke that it was me versus the preacher.....did the congregation come to hear the sermon or the organ?! For a few years I used this beautiful organ for weddings, lent it to churches who needed a replacement organ whilst theirs was being repaired or replaced....and of course it spent plenty of time being played for countless hours in our home too. I loved it - truly. At the same time I bought other old reed organs, stripped them down, learned all about them, repaired them, on-sold them and without knowing it developed a deeply satisfying and creative hobby that went hand-in-hand with my love of music. At a very low point in our life I decided that I should sell the beautiful Estey Artist's model reed organ to pay for bills that were piling up. I rashly sold it on eBay for $800.00. I remember having a rather wobbly bottom lip as it got hauled onto the freight truck and taken away to its new owner up in tropical QLD (Queensland). I remember looking at the back of the freight truck as it disappeared down the road and feeling my heart quietly breaking - I knew I had sold an irretrievably unique instrument all because I had not managed my money situation well. I was angry with myself and sorrowful too. Time passed, in fact years passed...many, many years. In the ensuing years, musical tastes inevitably changed within churches and my passion for beautiful classical organ music and hymnody quickly had no useful or meaningful purpose or outlet and thus I became redundant. I eventually just stopped playing at all, even at home. My world quietly shrunk and became a greyer place somehow. Also, over the course of years my faith changed (as it does) and eventually slowly rolled to a quiet stop...music-less, passionless, purposeless, outdated and lifeless. Never mind - there was a fabulous career to feed, a houseful of teenage daughters to continue 'dadding', goals to be achieved, purchases to be made...blah, blah, blah, busy, busy, busy. Yet another decade passed by. Then about a month ago, I was idly scrolling through eBay nostalgically looking at all the old antique reed organs for sale (all in various states of decay!) and there it was......was it truly it? I enlarged the image holding my breath looking for the unique markings I knew and remembered.....yes, it really was my old Estey Artist's reed organ for sale on eBay again after so many years. It had clearly been treated poorly - broken pieces, splits in the wood, ruined polish, cobwebs, dings and scrapes - in truly parlous condition. I bid and won the Ebay auction for $100. She got delivered by freightliner this Tuesday evening at 11:11pm. The tears flowed a little...just sayin'. 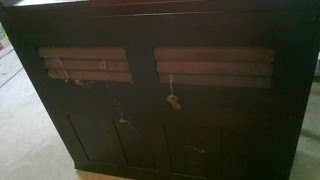 My once beautiful organ is in a terrible state from years of neglect and abuse. She reluctantly managed to whisper a few tired, excruciatingly sad breathy notes for me before the mouse-chewed bellows collapsed completely and she fell silent......but she is home now, never, never to be sold again. One of the many repairs needed. 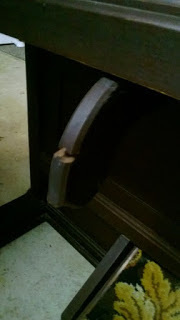 She will be lovingly dismantled, every piece carefully labeled and catalogued as I go, bellows will be recovered, every brass screw polished, every crack glued, every lever repaired, every reed tuned, each felt renewed, every ivory buffed, the case work will be repaired and re French-polished .... she will live again. It will take a couple of years of diligent repetitive restorative work on my behalf....and then she will again sing out clear her songs of love and faith again. Who knows, I might even find a better and more meaningful version of my lost faith again in the process of resurrecting this beautiful instrument back to life again. Take care folks...and stay nice.